Description: Vintage Skipper-inspired A-line dress with collar & cuffs. Tips: Use a patterned fabric for the bodice/sleeves and a solid color for the collar/cuffs for a classy look. Attaching the cuffs could be a bit tricky, so you might want to make a practice one first. Press before attaching the pieces. Oooh I have to try this one! The collar looks lovely. Yeah! 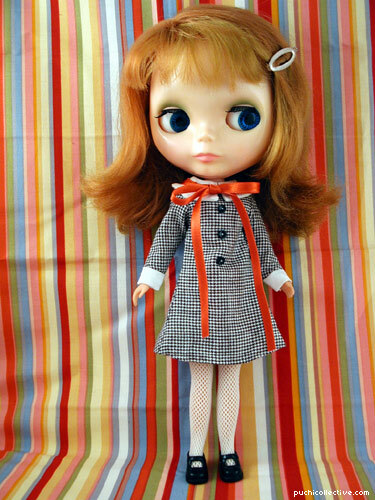 I can have twin outfits and make it in other tweed fabrics! Amazing! Thanks so much for sharing all of this wonderful stuff. The dress became really pritty but i failed with the collar… Thanks for upload this pattern! I’m a little confused. When making the dress, do I cut two of the large pieces? That seems the logical thing to do, but I thought I’d check. I don’t see a seam line through the front of the dress. Tashi – what do you mean by “two of the large pieces”? The bodice is one whole piece – it is folded at the front when you cut the pattern – open it up & it should be shaped like the letter “Y”. I think I see what you mean, Linda… I was under the impression that the “front center (fold here)” was referring to folding the fabric, somehow, and I didn’t see how that long V fabric could possibly be a dress, haha. I think I’ve folded it the right way now, and I’ll be testing it very shortly. Thanks for the clarification! hi sorry i know i shud already know this, i printed it straight out and the scale is correct as the pdf, but it seemd a little too big, shes Mod molly sbl. should i shrink the pattern a little bit? Hi Mandy – SBL/EBL/RBLs have the same body so the pattern should work fine. The original Skipper dress (which the pattern is based on) is a little loose in style. If you like the dress to be a bit tighter, feel free to adjust the pattern accordingly. Have fun! This pattern doesn’t make sense to me! Do you cut 4 of those sleeves? And two of the large pieces?! Hi Rebecca – The dress is not lined, so no. Two sleeves and just one large piece that make up the body. I still don’t understand how you get the y shape though! I only seem to have half a dress! Hi Rebecca – if you don’t fold the fabric, then yep, you only get half a dress. Cut the paper out as is, fold your fabric in half, and line up the center front of the paper pattern to the edge of the fold, pin & cut out the “half-Y” shape. When you’re done, unfold it and you should have a Y-shape. Hope that helps!